The magic words in the online customer service world: ticket deflection. Your customers find the information they need as quickly and painlessly as possible. It makes your clients’ experiences even better. And when you do this, you’ll require fewer and fewer agent hours. Before you think about these Zendesk Help Center tips, there are a few design and setup pillars which you must cover. …Making sure it works (across all platforms)! Once those are covered, here are a few more advanced ways to get more out of your Help Center. Creating a script that dynamically populates the most commonly searched keywords in the Help Center (regardless of language or location) will not only save your customers from typing, or making spelling mistakes, but also suggest terms that are more accurate. This is another script that will dynamically populate the most clicked and popular articles in the Help Center, giving them greater visibility. It’s all about reducing time-to-resolution. Did you know you can customize the Help Center so that any language can be supported by Zendesk? It takes a little bit of work, but if you have a significant client base in non-mainstream language, you might find it worthwhile. Want to create something more slick? You want single page navigation? You can create the (trendy and easy to use) single page navigations, custom menus and any kind of navigation out there. It’s a popular customization, often times faster to find necessary information, and makes it harder for your clients to get lost. Add videos, icons, product documentation (whether pdf, doc, etc), iFrames, and any kind of custom pages, to create a better user experience. Facebook and Help Centers work really well together. It is possible to integrate your whole Help Center into a Facebook tab. You can provide customer service through Facebook, which for many B2C would make sense. Customized surveys can be implemented to monitor client satisfaction and feedback. Whenever we talk about Help Centers, the quote from Socrates, “A good question is half the answer” is pretty relevant. Implementing a great, integrated survey, can dictate product and service direction in an important way. Moo does a great job with their Zendesk help desk. Here, the 3 right hand side boxes have agent availabilities for each country MOO offers support in. 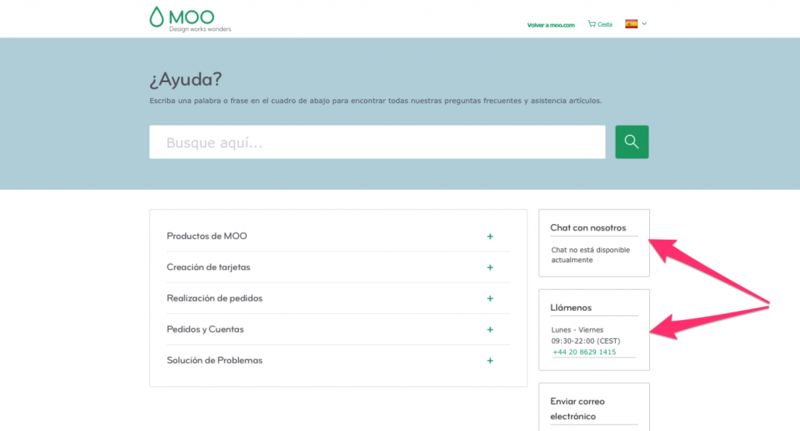 An example of how Moo displays localized agent availabilities, in this case for Spain. Another example is Clarizen upcoming events area at the bottom of the Help Center. Which makes sense. The Help Center audience is clearly captive and engaged in the brand, why not serve them relevant updated content? Besides all that, the Zendesk Help Center can be customized to do just about anything you can imagine. And it isn’t only applicable to Zendesk. (Other help desks, such as Desk.com, Kayako and others can do some if not all of what is discussed above.) Be relentless in your pursuit to deliver great online customer service. Whether lowering time to resolution, improving ticket deflection, increasing brand loyalty, or any other reason, be proactive and you’ll see great results. Hope these Zendesk Help Center tips help!